Instructions: Prepare a 5 x 7" white card base. Die cut one of the Eyelet Lacy Frames out of white cardstock and adhere to the card. Cut one of the Eyelet Rectangles out of white cardstock, add foam dots to the back and adhere to card. Stamp the sentiment from the Cheerful Notes Sentiments on white cardstock with the Deep Purple ink, cut out with the Album and Tags die, add 2 tiny purple brads in the holes, add foam dots to the back and adhere to the card as shown. 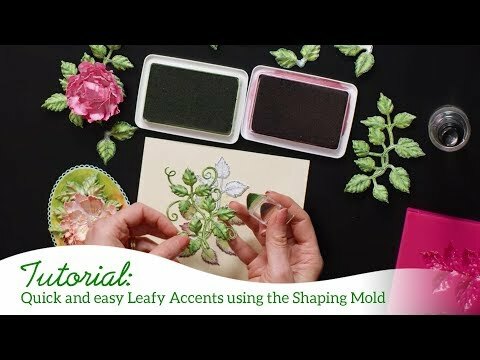 Stamp all the leaves on white cardstock using the black ink, color in with the Leaf Green, cut out with the coordinating die, ink the edges with the Library Green ink and shape using the molds. Stamp the Pansies on white cardstock with the black ink, color with the yellow and Lavender lace ink and cut out with the coordinating die, ink the edges with the Deep Purple. Place in the mold and shape, assemble the flowers. 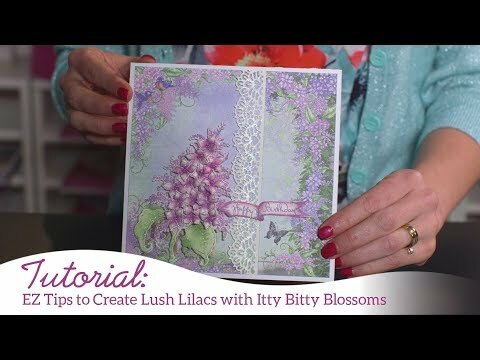 Stamp the Lush Lilacs on the vellum with the White color Box ink, heat emboss with the Bridal Tinsel embossing powder, shape using the Deluxe Flower Shaping tool kit. Use the coordinating die to cut out the leafy accents that are pre-colored from the Lush Lilac paper collection. Adhere all the leaves and flowers on the card. To finish, add glitter, Prills and crystal drops to the leaves and flowers.